Chayapong Naviroj has a swing in his step. By day he works as a fruit supplier for large stores like The Mall and Tesco Lotus, but by night he channels Frankie Manning and Dean Collins when he steals away to The Hop, the home of Bangkok’s swing dancing scene. Chayapong Naviroj and Youngji Kim, one of the instructors, doing the Lindy Hop. 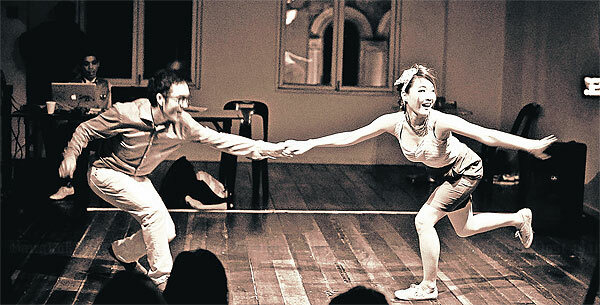 The Hop opened its doors to dance enthusiasts two years ago when Chayapong returned to Bangkok after attending college in the US. 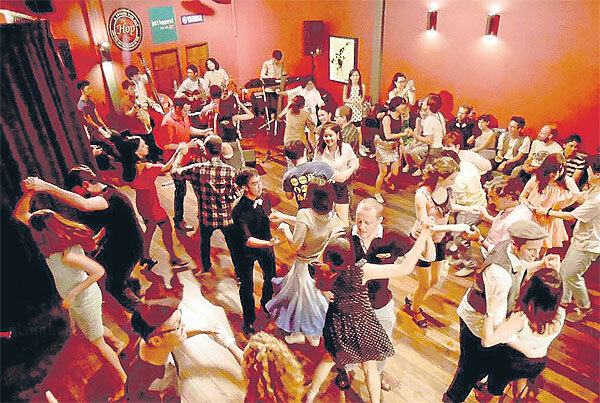 The place isn’t just a swing dancing bar _ Chayapong has also built a community, Bangkok Swing, whose members range from businessmen and lawyers to teachers and artists, mostly in their 20s and 30s, from all over the world, united by the Lindy Hop. Their soundtrack: Duke Ellington, Count Basie, Benny Goodman, Nat King Cole and the likes. Their outfits: suspenders and polka dots and head-wraps. They meet every Tuesday and Saturday night to travel back to 1920s Harlem. When he was a doe-eyed freshman at the University of Pennsylvania, Chayapong walked down the main pathway through campus, taking every flyer for every club at a fair during orientation. He was struck by one featuring a man tossing a woman in the air. “The flyer said, ‘No experience necessary’. When I showed up, they pinned a number on me. It turned out to be an audition,” Chayapong said. He immediately became hooked on the jitterbug, even more so the sunny attitude that came with it and the community built around it. “It was the one thing I stuck with throughout college,” he said. And it was the one thing he brought back with him from the States, the love and desire to spread the dance’s air steps, its dips and slips and flips and slides. Chayapong began teaching swing dancing as soon as he got back to Bangkok in 2011, when he found out there wasn’t an established swing dance scene in the city. He rented out studio spaces and gyms and called friends. “I was either just breaking even or losing money. I taught every Saturday. I recruited friends. When I invited 10 people, one would show up so I had to invite 30 for three to show up. [Swing dancing] is a type of happy dance. People are likely able to bring their friends along. It’s like a ripple effect. When [our group] started, about 90% were foreigners. It’s kind of a foreign lifestyle. “After two years, it’s about 50-50. Now we have a scene of about 100-200 people. Around 30 people show up each social night,” he said. In organising these nights, Chayapong has unwittingly created a family. The organic growth of Bangkok’s swing dancing scene led him to build The Hop, renovating a shop house in Silom to create a dance studio. Again he worked on weekends, with the help of a small construction crew, designing the high ceiling, picking out wood for the floor and constructing the bar. “I wanted to recreate that feeling, that speakeasyI-don’t-care-about-other-people-let-me-do-my-cool-thing-with-my-community feeling,” said Chayapong. Although this speakeasy, with its warm red walls and highballs, its sea of shiny pomaded hair and even shinier brogues, is the opposite of exclusive. Chayapong wants people to talk about it, to bring their friends and to share the love. The Hop is a studio space with a motto, “Let the art be defined by you”. Besides weekly swing dancing, the studio hosts a variety of events including origami and paint and drawing workshops, as well as recent classes that teach kids how to perform in a musical. The Hop celebrated its first birthday last October, with many plans for the future. Bangkok Swing will host “SEA Jam”, an annual event bringing dancers across the region together for a swing-filled weekend, at the end of February. “It’s essentially a dance marathon. We’ll be having workshops all day and then dancing all night,” he said. “Taste in music defines people, sometimes. It’s funny. Swing dancers have a certain attitude, as if their attitude is derived from the music. If you go to a rock concert, you may get the ‘Hey, yeah, I’m cool’ vibe, but if you go to a hip hop show, it’s a whole other experience. It just happens that the Lindy Hop is jolly, jumpy music,” Chayapong observed, speaking as though he’s dancing, a cheeriness present in in his steps. – The Hop is located at 252/8 Silom, Bangrak, Bangkok 10500, Thailand (Between Silom 18 and 20). – Visit thehopbangkok.com for more. Dancers at a weekly social at The Hop.